Fight monsters and find your humanity. Alongside our team-selected 2018 Game of the Year awards, each member of the PC Gamer team gets to champion one favorite from the year. We'll continue to post new personal picks until the end of 2018. In 2018, one of the best point-and-click adventure games was conjured into existence. 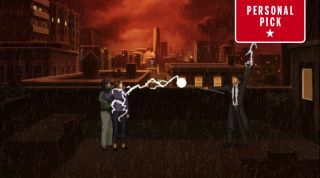 Unavowed leaves you picking up the pieces after you were possessed by a demon for a year, kicking off the strongest story Dave Gilbert’s written, so far. And, as always, it's accompanied by striking art from Ben Chandler, who manages to capture New York while simultaneously transforming it into somewhere otherworldly and magical. It’s urban fantasy with pulp noir undertones, but instead of devolving into gritty, detective cliches and hard-boiled cynicism, it’s an empathetic story full of complicated, believable characters who learn and forgive. There’s a lot of humanity in this game about stopping monsters. The world they inhabit is just as fascinating and well realised. Instead of a tour of internationally famous landmarks, it’s a quieter, smaller vision of New York. I felt like a local in a city I’ve only visited once for a few days. And it feels old. The titular Unavowed, an ancient order determined to stop evil, have called it home for centuries and share some of its secret past. There’s always the juxtaposition of the magical and mundane, from djinn riding in subways to monsters lurking in the New York harbour. Puzzles are elegantly woven into the story and avoid classic pixel hunting frustrations and faffing around in your inventory. They’re not especially tricky head-scratchers, but they’re usually inventive enough that solving them is just as satisfying. That's a tricky balance to find, and Unavowed rarely slips. And you're not solving them alone. The Unavowed are all about teamwork, and the one conundrum that really gave me pause was figuring out who to take with me on my adventures. Companions can help, or at least offer guidance, acting like an unobtrusive hint system, as well as potential solution themselves. They otherwise function a lot like BioWare companions, grounding you in the world by giving you friendships to hold onto. Bringing specific buddies opens up new dialogue options and solutions, and the system fits as comfortably with an adventure game as it does an RPG. Better, perhaps, since their most important attributes aren't combat related (though one of them has a sword that comes in handy), it's their expertise and insight. Another arguably RPG-like trait is the importance Unavowed places on the choices you make at key points throughout the game. Sometimes it can be a bit too obvious that you’re making a Meaningful Choice™, but I’m still thinking about them months later. I was agonising over the final moments of the game again yesterday, replaying my last decision and the closing seconds in my mind. It wasn’t really a decision, though. My choice was inevitable, based on my version of the protagonist, developed over 10 hours of supernatural crises. Despite starting out as an amnesiac—a tired trope that’s used surprisingly well here—I knew exactly who I was playing by the end. Unavowed isn’t a love letter to traditional adventure games or trading in nostalgia—it’s an adventure game with forward momentum. Sure, at times it’s evocative of games like Gabriel Knight, but it also feels new and novel. When it plays with the familiar, it subverts it, dragging us along in an unexpected direction. And it knows when to end! How many games know that, these days? It clips along at a reasonable pace, ramps up towards the end and then boom, big finale and then it’s done, probably in a few sittings. I’m ravenous for more but don’t feel short-changed. A compelling yarn doesn’t need to take 60 hours. Not that I wouldn’t happily play 60 hours of Unavowed.